We all know that ‘time is money’. If your WordPress site is taking too much time to load, you could be losing big-time. As we now know from Google’s ‘Webmaster’ blog back in 2010, site speed is one of the key factors impacting the search ranking of a website. It is often overlooked, but it can be a critical problem. And it’s easy to see why: browsing on a slow website can be incredibly frustrating, especially via mobile data on a smartphone. You’re having to wait way too long for a page to load just to find out that it doesn’t have what you’re looking for, and the next page isn’t noticeably faster. Meanwhile, your precious data is being sucked dry loading unnecessary images and poorly-designed architecture. Time and time again, we’ve been shown that this really does affect viewership. Now, more than ever, we are battling for people’s attention and if your site doesn’t keep up the pace, many people will leave before they’ve even seen what you have to offer. If your page is taking 3 seconds or more to load (or weighs more than 2MB) you may be losing a lot of money in the form of both potential leads and in server costs. We have a tendency to try and put too much information on each page, both through text and images, but having too much on one page might be slowing your WordPress site down too much. 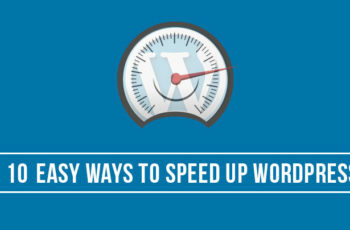 If you want to see higher web rankings, increased conversion rates, better user feedback, decreased bounceback rates, and a happier budget, then it’s time to take these 10 steps and speed up your WordPress site! Images are often the biggest thing impacting a site’s performance. If you’re using an inefficient file types, using images that are too large, or just not optimizing them for a good quality-to-size ratio, it could be taking a heavy toll on your site. Use Photoshop or similar image editing software to optimize your image. Save images at a quality cap of 60%. For JPGs, make sure to enable progressive rendering. This will improve page performance at the touch of a button! By default, use only JPG files. If you need an image with text, use a PNG. Avoid using GIFs if at all possible, as they are incredibly cumbersome. Using a JPG instead of a PNG can reduce image size by 6-8 times without losing any quality! Finally, make sure to scale your images properly. Never do this in HTML, creating a smaller image. Instead, use the original image to create a thumbnail matching the required dimensions that links to the full image. This will preserve image quality and allow people to click the image if they want to see the image in better, fully zoomable detail. If your site has viewers all over the world, this is a must for you. Content Delivery Networks, or ‘CDN’s, are cheap (often free) ways to reduce your server load while simultaneously making load times more consistent across the globe. They are networks made up of multiple servers in different places around the world, ensuring that nobody that uses your site is too far away to get a good download speed. With a good CDN, you can make your website more professional and more accessible to a wider audience. For starters you can give Cloudflare a try. 404 errors (page not found) are surprisingly common. That is why it’s so important to be ever-vigilant in ensuring there are no 404s on your site. They slow down traffic, frustrate and confuse viewers, and look just plain unprofessional. Don’t let ‘the Disappearing Page’ be the final act for your viewers! When you enable caching on your page, the viewer’s browser will temporarily save viewed pages so that if they go back to a previously viewed page it will be able to load the data locally instead of requesting it to be sent again. This can dramatically increase site performance and reduce traffic, making it an easy win-win for all. There are many WordPress plugins that you can use to enable caching. Too many CSS files running on your page will mean longer wait times for everyone. Since a browser can only take a limited number of HTTP requests all at once, some files will be queued up until the next is finished. To avoid this, inline small CSS files (2KB or less) so that they don’t take up an extra request all on their own. There are a multitude of plugins for WordPress that can help you do this. Sometimes, too much is too much. Do what you can to reduce your page size by deleting text or images that don’t bring enough substance or value to the table. Optimize databases, minimize HTTP requests, and create separate pages for separate ideas. Each page should be quick to read, easy to understand, and fast to load. Spread the weight more evenly across your pages to ease the strain on one. All of this can get pretty confusing and can seem overwhelming. When in doubt, do not be afraid to ask for help. There are a lot of people doing this for a living because they’re good at what they do. Scout around, do plenty of research, and find a well-priced and seasoned veteran to optimize your WordPress site like nobody else can. You might be surprised by just often this starts as an expense but ends up being an investment. If you want something done, make sure it’s done right.